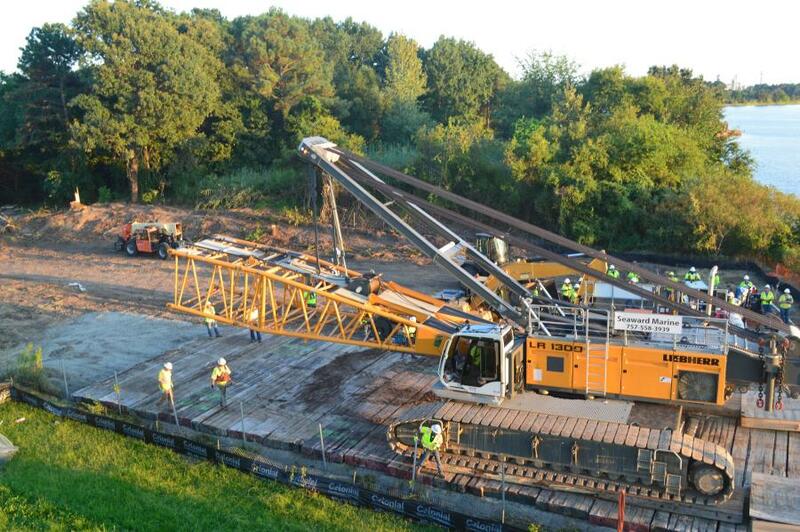 The first project crane is delivered to the construction site by barge. A $409.6 million bridge and highway project under way in Chesapeake, Va., constitutes the largest design-build contract awarded by the Virginia Department of Transportation (VDOT) to date. The work involves improvements and expanded capacity along nearly 9 mi. of I-64 and the creation of a new fixed-span bridge with 100-ft. vertical clearance. When the project is completed, the existing bridge will carry only I-64 eastbound traffic (toward I-264/Bower's Hill), while the new bridge, which will be constructed immediately to the south, will carry I-64 westbound traffic toward Virginia Beach. The current bridge was opened in 1972 and crosses the Southern Branch of the Elizabeth River. Phase 1 of the I-64 Southside and High Rise Bridge project began in the summer of 2018 and is scheduled for completion in July 2021. The project was awarded to Granite-Parsons-Corman (GPC). VDOT's project director is Mike Prezioso, and the project manager for GPC is Glenn Olechnowich. Funding for the project is provided by the Hampton Roads Transportation Accountability Commission, Virginia's Smart Scale Program, and the Federal Highway Administation. VDOT determined that a design-build contracting approach would expedite delivery of the I-64 High Rise Bridge project. Under this method, the designer-builder performs final design, right-of-way acquisition, utility relocation, permit acquisition and construction, thus allowing some of these activities to be pursued concurrently. According to Dave Forster, senior communications specialist for the VDOT Office of Communications, the new bridge will be built immediately to the south of the existing High Rise Bridge, which will remain in operation. To create space for the new High Rise Bridge, a new Great Bridge Boulevard bridge will be built over I-64 directly to the west of the current bridge, which will remain in operation until the new bridge is completed and traffic is shifted onto it. The new bridge will feature larger sidewalks and bike lanes in each direction. Preparations for construction of the new Great Bridge Boulevard bridge over I-64 began in October, and completion is expected in late 2019. Also in the scope of the project is an additional, managed lane to be built in each direction from Bowers Hill to nearly 1 mi. past I-464. Managed lanes are proposed high-occupancy toll (HOT) lanes with a variable fee that is adjusted in response to travel demands. In addition, exterior shoulders between George Washington Highway and Great Bridge Boulevard will be built to provide an additional toll-free managed lane during peak congestion. New lanes will be built mostly in the median of the existing interstate. The contract also calls for six bridge widenings over Military Highway, Yadkin Road and Shell Road. Other work will include drainage improvements, including stormwater management facilities, noise barrier walls and an asphalt overlay for existing interstate lanes. "Project safety and environmental quality are top priorities at VDOT and are stressed throughout from start to finish," Forster said. One of the particular challenges with this project is maintenance of traffic, he noted. "Two lanes will be maintained in each direction of I-64 during the vast majority of construction," he said. "Single-lane closures will be limited to night operations. Lane closures are coordinated with other nearby VDOT projects and communicated to the public on a weekly basis." Another challenge is the fact that construction is taking place in a commercial shipping and maritime recreation channel. Forster noted that outreach and notification to the maritime community, including a maritime work plan, was built into the design-build contract. The first notice to mariners went out in October. VDOT also is mindful of the inconveniences construction imposes on residents and businesses. "Noise, traffic and other impacts from construction are unavoidable on projects of this scope," Forster said. "As it does with all of its projects, VDOT has placed an emphasis on communicating early and often with its stakeholders, providing advance notice of impacts and being responsive to concerns." 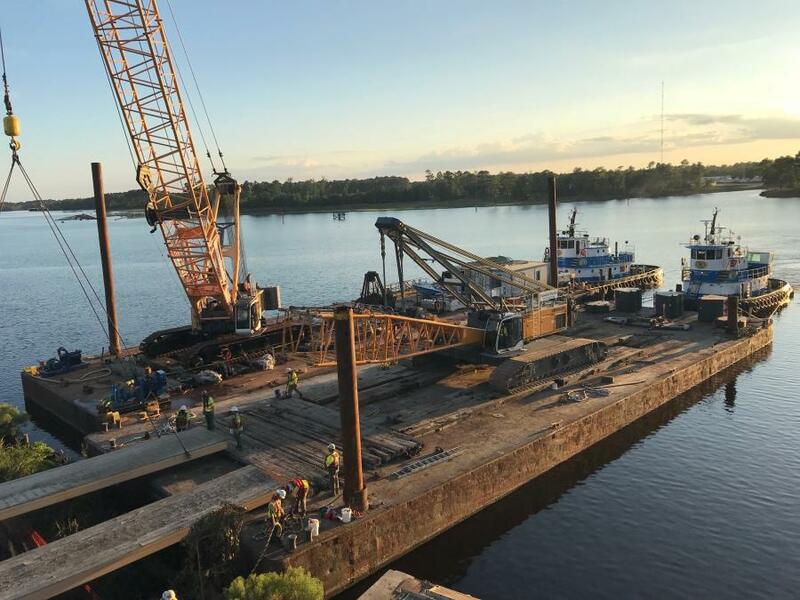 According to VDOT, the first project crane arrived on site in early September — a Liebherr 1300 crawler delivered by barge by locally owned Seaward Marine. 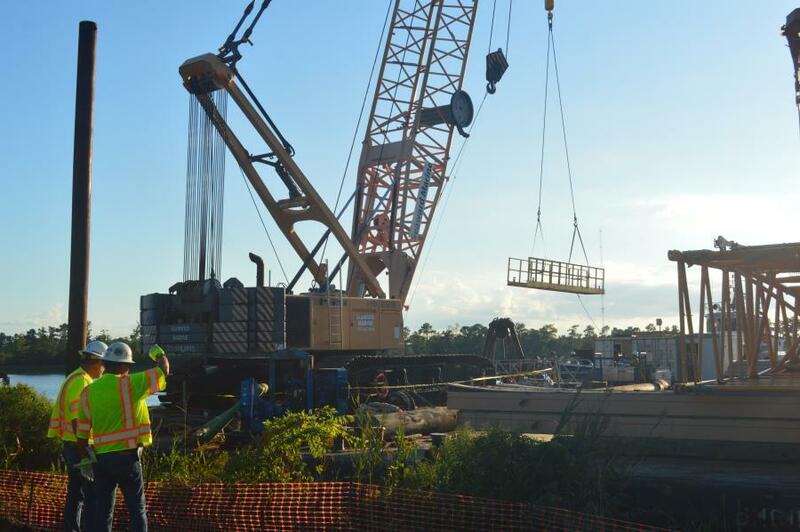 An assist crane was used to transport the project crane from the barge to the construction site. Project cameras will allow for viewing of construction progress. Currently, one camera is situated to the east side of the existing High Rise Bridge with four different camera views/angles, including a panoramic view of the full bridge. Additional cameras along the project corridor will be added as construction progresses. The project was reportedly designed to accommodate a future project that will expand the corridor to a total of eight lanes. Major subcontractors for the project include Alan Meyers for paving, Branch Civil for earthwork/drainage, D T Read Steel Co. Inc. for F&I Rebar/SIP, Hardscapes for FSI MSE walls, Webb for jack and bore, Portico for electrical/ITS, Bryant-Ritter for overhead signage/ITS, Vokert for quality assurance, DMY Engineering Services for quality control, Spivey Pavement Markings for MOT/pavement markings, West for clear & grub, Curtin for temp barrier, and Seventh Point for public communications. Major suppliers include Coastal Precast for precast concrete piles, beam and tubs, W&W AFCO Steels (formerly Hirschfield) for structural steel, CRMP (Commercial Ready Mix Products Inc.) for concrete, Luck Stone & Vulcan for aggregates and DOKA for formwork. According to VDOT, the roadway work will require 266,500 tons of asphalt, 68,000 tons of cement-treated aggregate, 230,000 cu. yds. of excavation, 129,000 cy. yds. of embankment, 39,000 cu. yds. of select backfill and 48,000 linear ft. of drainage pipe. It also includes a 735,000-sq.ft. noise wall. Construction of the new High Rise Bridge will consume 216 36-in. square concrete piles; 66 66-in. concrete cylinder piles; 32 24-in. concrete pile abutments; 70,000 cu. yds. of concrete; 13 million lbs. of rebar; and 272 concrete beams from 140 to 196 ft. long. In March 2013, the Hampton Roads 2034 Long-Range Transportation Plan was amended to include an environmental study for the improvement of the Interstate 64 (I-64) corridor from I-464 to I-664/264, including the High Rise Bridge. The purpose of the environmental study was to develop alternative solutions to address insufficient transportation capacity and correct roadway and bridge deficiencies throughout the corridor. The Draft Environmental Assessment was approved by Federal Highway Administration in October 2014. In March 2015, the Commonwealth Transportation Board (CTB) identified Candidate Build Alternative 2, the addition of two lanes of capacity in each direction including the construction of a new bridge and replacement of the existing bridge, with a decision regarding the management option to be made at a later date. In its resolution, the CTB encouraged the Hampton Roads Transportation Planning Organization (HRTPO) and the Hampton Roads Transportation Accountability Commission (HRTAC) to work with VDOT to identify funding for inclusion in the HRTPO planning documents and to determine the appropriate management options for the corridor. In July 2015, VDOT embarked on a phasing study to determine how best to deliver the project. 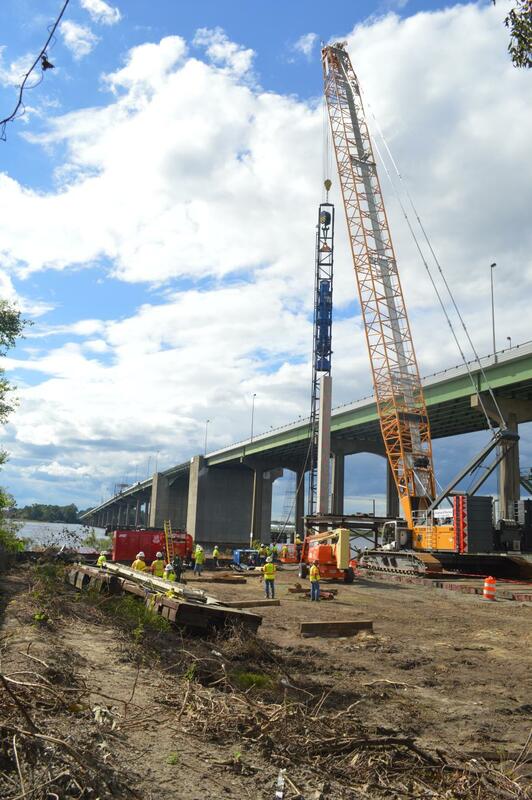 VDOT evaluated cost and schedule risks with the phased construction approach that would enable construction to begin on the I-64 High-Rise Bridge. The Hampton Roads Transportation Planning Organization endorsed the study's findings and made the decision to build the project in two phases. 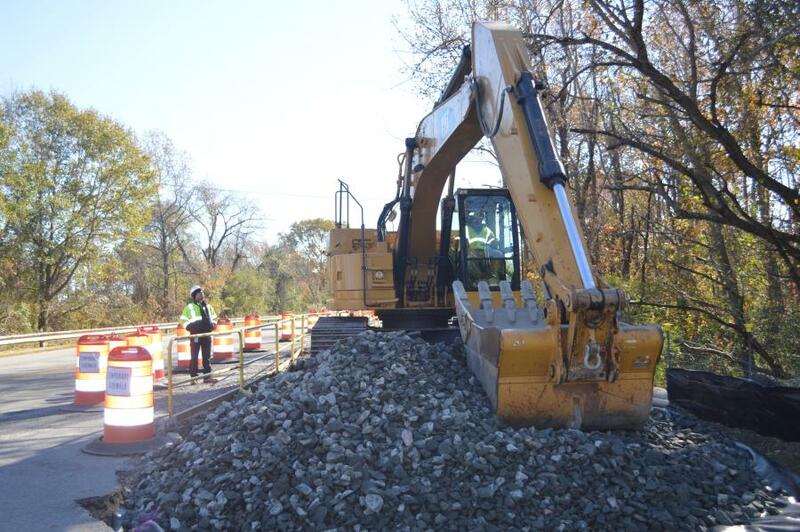 In February 2016, VDOT started development of a Design-Build Contract for Phase 1. The Hampton Roads Transportation Accountability Commission allocated right-of-way and construction funding for Phase 1 at its June 16, 2016 Regular Meeting. On Aug. 22, 2016, the Federal Highway Administration issued a Finding of No Significant Impact (FONSI), concluding the National Environmental Policy Act process and allowed the project to be advanced to more detailed levels of design. The request for qualifications from design-build contractors for Phase 1 was issued in August 2016. The request for proposals from qualified design-build contractors who were short-listed was issued in December 2016. The selection process culminated in the contract award by the Commonwealth Transportation Board on Oct. 24, 2017. The notice to proceed (NTP) for the design-build contractor was scheduled for November 2017.